· Emergency help · go home with one button · Send alarm information to the management center · Holding code alarm · User-defined private lock password, security password and hold password. 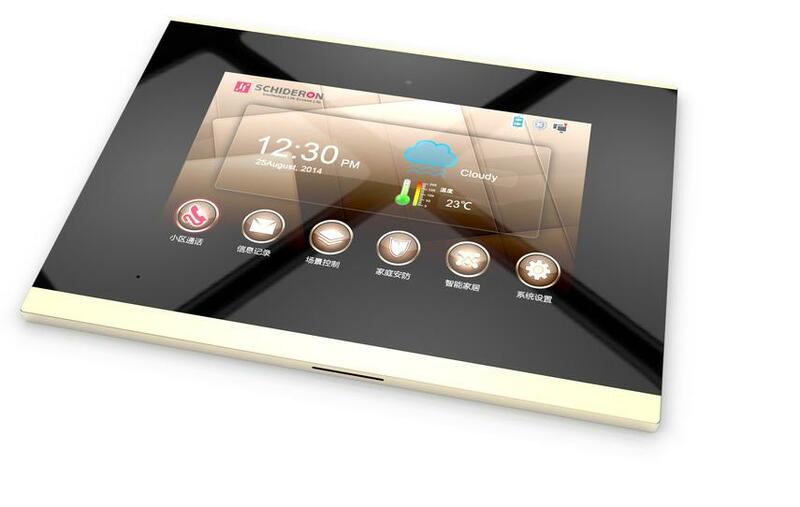 Ddp-805nc-x7 is a wall mounted color hands-free video intercom with multiple functions.An 8-inch LCD display screen with a resolution of 1280 x 800.With the gold-plated G+G glass capacitor touch, video encoding and decoding adopts h. 264, so it can support hd two-way video intercom.The chip adopts SCHIDERON's X7 core board series CPU chip and Android 4.4 system architecture. It has the advantages of fast operation, high stability and low overall power consumption, and supports online upgrade.Comprehensive security function -- the system comes with 16 independent defense areas, which can be connected with intrusion, gas, smoke and other sensor devices.When the household is not at home, the visitor's photo is automatically saved for the customer to view at any time.An s-net interface seamlessly connects with SCHIDERON's smart home host and module, and the warm home scene only needs to be activated by one finger.